It seems that almost every start-up wants to disrupt something, to follow the footsteps of Amazon who disrupted and almost destroyed the traditional bookstore method of buying books. Surprisingly the local bookstore is making a bit of revival, because it turns out that buying a book involves more than reading reviews and downloading content. People love browsing, talking to salespeople who are passionate readers, buying a cup of coffee and sitting in the cozy warmth of a bookstore. That doesn’t mean that the people who love bookstores don’t also love Amazon. They do. Both options fill a need. But Jeff Bezos didn’t stop at disrupting the bookselling industry, he has gone on to disrupt the entire retail industry. I get it, investors want to invest in the next Amazon. Everyone wants to be a gazillionaire. Now, let’s look at Apple. Apple did not invent the personal computer, nor the idea of a portable phone. Apple didn’t disrupt the computer industry, Apple transformed the industry’s emphasis from engineering better products to designing better looking and easier to use products. Apple was not a disrupter as much as a transformer – and they became the most profitable public company in the world. So why are start-ups so interested in disruption? Disruption has a destructive connotation, while transformation has a positive connotation of building on the existing and adding value. Transformation also connotes innovation, a word also over-used these days, but I digress. How do these words disruption and transformation relate to architecture and interiors? In our work, we specialize in transforming existing spaces to make them work better, look better and feel better. Our goal is to minimize disruption since most of our projects are constructed (and demo’ed) while they are occupied. 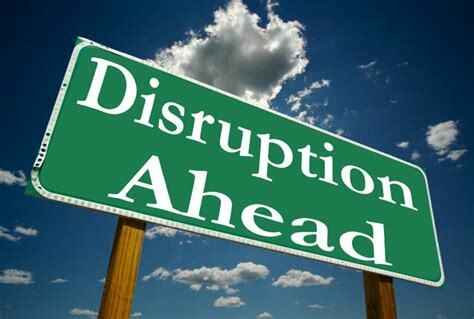 That could be the reason I really don’t like the word and meaning of disruption. Since I began my professional life there have been many innovations for renovation projects, to make them less disruptive, including zip walls and sticky mats that contain dust, and sticky plastic and paper rolls that protect floor finishes. Construction and reconstruction have also become less disruptive due to better project management tools, that allow contractors to predict when particularly noisy or dusty work will happen. As we all know, better communication and setting expectations will make for better projects. The successful transformation of the spaces we design makes for a work life filled with joy and gratification. Several of our most recent projects have been large: in size, in the number of people who have had input along the way, and in complexity. [Note: renovations are, in general, more complex than new construction]. Four projects finishing up this spring had their first meetings as long ago as 2014! The design process can be quick and it can be slow, due to many factors. We think disruption is easy, but it may be necessary on the road to transformation. Let’s improve the way things are, let’s re-use what we can re-use, let’s throw away less, and let’s make the world a better place for people who work, play, age, live and learn.